Robert Capa репортаж фотография . 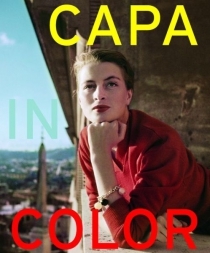 This beautiful book looks at Robert Capa's color photography, a little-known but important aspect of the great photographer's work, and includes many never-before-published images. Famed photojournalist and founder of Magnum Photos, Robert Capa was primarily known for his black-and-white images. But after World War II he turned increasingly to color, fulfilling assignments for a variety of popular magazines such as Life and Holiday. This volume reproduces Capa's color images in a wide variety of forms including prints, magazine spreads, book jackets, and other ephemera, revealing the photographer at a point in his career when his role as director of Magnum required that he keep up with current technology--both as a business decision and a way of capturing new assignments. This book also features a contextualizing essay by International Center of Photography curator Cynthia Young, travel writings by Capa and assignment collaborators John Steinbeck and Irwin Shaw, and brief essays providing background on various pieces of reportage.